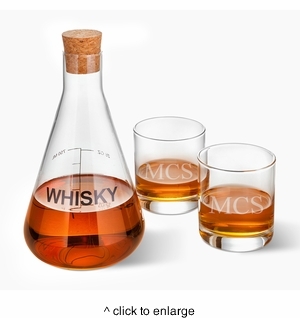 DETAILS: The whiskey decanter set is part of the new Artland Mixology Series, a unique and fabulous take on decanting and displaying your liquor for friends and family to see. Also makes a great personalized gift set! PERSONALIZATION: 2 lines up to 15 characters per line, Single initial, one of our 3 monograms - Stamped, Modern, Circle - allowing for 1 line up to 15 characters, 3 Initials in the order of First, Middle, Last.